Plasmas are complicated because motions of electrons and ions are determined by the electric and magnetic fields but also change the fields by the currents they carry. For now we shall ignore the second part of the problem and assume that Fields are Prescribed. Even so, calculating the motion of a charged particle can be quite hard. Have to solve this differential equation, to get position r and velocity (v= · r) given E(r,t), B(r,t). Approach: Start simple, gradually generalize. 2.1 Uniform B field, E = 0. 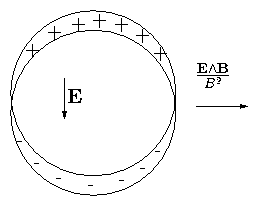 Figure 2.1: Circular orbit in uniform magnetic field. ⎠ = q v. (v∧B) = 0 . Parallel and Perpendicular motions separate. 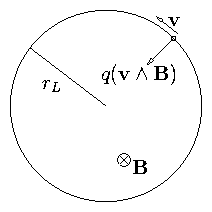 v|| = constant because accel ( ∝ v∧B) is perpendicular to B.
Ions rotate anticlockwise. Electrons clockwise about the magnetic field. The current carried by the plasma always is in such a direction as to reduce the magnetic field. This is the property of a magnetic material which is "Diamagnetic". When v|| is non-zero the total motion is along a helix. Constant acceleration along the field. Speed of positive particle is greater at top than bottom so radius of curvature is greater. Result is that guiding center moves perpendicular to both E and B. It `drifts' across the field. which we calculated for the E = 0 gyration will satisfy the equation of motion. vd (eq 2.17) is the "E × B drift" of the gyrocenter. It is independent of the properties of the drifting particle (q, m, v, whatever). Hence it is in the same direction for electrons and ions. Underlying physics for this is that in the frame moving at the E × B drift E = 0. We have `transformed away' the electric field. Formula given above is exact except for the fact that relativistic effects have been ignored. They would be important if vd ∼ c.
This is just like the Electric field case except with F/q replacing E.
In this case, if force on electrons and ions is same, they drift in opposite directions. This general formula can be used to get the drift velocity in some other cases of interest (see later). Curvature of orbit is greater where B is greater causing loop to be small on that side. Result is a drift perpendicular to both B and ∇B. Notice, though, that electrons and ions go in opposite directions (unlike E∧B). We try to find a decomposition of the velocity as before into v = vd + vL where vd is constant. Now we shall find that vd/vL is also small, like r| ∇B | /B. Therefore the last term here is second order but the first two are first order. So we drop the last term. 0 = vd ∧B+ 〈vL ∧(rL . ∇ ) B〉 . (Taking ∇B to be in the y-direction). This is called the `Grad B drift'. When the B-field lines are curved and the particle has a velocity v|| along the field, another drift occurs. Take |B| constant; radius of curvature Rc. To 1st order the particle just spirals along the field. 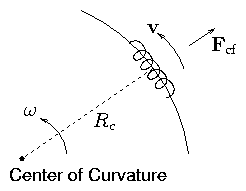 In the frame of the guiding center a force appears because the plasma is rotating about the center of curvature. This is the "Curvature Drift". The curvature and ∇B are related because of Maxwell's equations, their relation depends on the current density j. A particular case of interest is j=0: vacuum fields. (r Bθ ) (Br = 0 by choice). and hence (∇ B)perp = − B Rc/Rc2. Rc & ∇B drifts are in the same direction. They are in opposite directions for opposite charges. Since particles can move freely along a magnetic field even if not across it, we cannot obviously confine the particles in a straight magnetic field. Obvious idea: bend the field lines into circles so that they have no ends. Ions drift up. Electrons down. There is no confinement. When there is finite density things are even worse because charge separation occurs → E → E ∧B → Outward Motion. 2.5.1 How to solve this problem? What Bz is required to cancel this? So Bz = − mv||/ Rq is the right amount of field. But Bz required depends on v|| and q so we can't compensate for all particles simultaneously. Vertical field alone cannot do it. Toroidal Coordinate system (r, θ, ϕ) (minor radius, poloidal angle, toroidal angle), see figure 2.8. 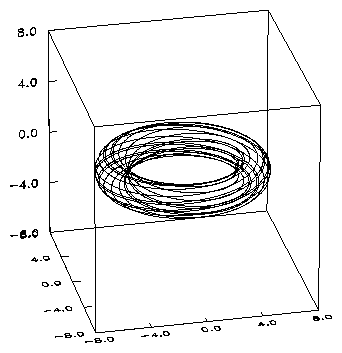 Field Lines become helical and wind around the torus: figure 2.10. 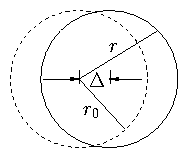 In the poloidal cross-section the field describes a circle as it goes round in ϕ. Now add on to this motion the cross field drift in the ∧z direction. 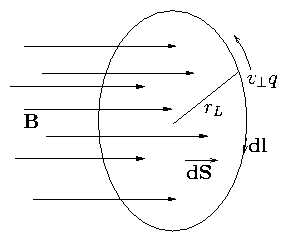 where rLθ is the Larmor Radius in a field Bθ ×r / R.
Provided ∆ is small, particles will be confined. Obviously the important thing is the poloidal rotation of the field lines: Rotational Transform. Actually the value of these ratios may vary as one moves around the magnetic field. Definition strictly requires one should take the limit of a large no. of rotations. qs is a topological number: number of rotations the long way per rotation the short way. In the above situation there is a net force along B. Calculate Br as function of Bz from ∇ . B = 0. Suppose rL is small enough that [(∂Bz)/(∂z)] ≅ const. 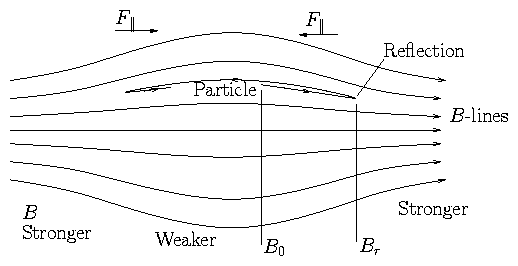 As particle enters increasing field region it experiences a net parallel retarding force. m v⊥2 / B . This is force on a `magnetic dipole' of moment μ. Our μ always points along B but in opposite direction. Figure 2.14: Force components on an elementary circuit constituting a magnetic dipole. (Using ∇ . B = 0). μ is the (vector) magnetic moment of the circuit. 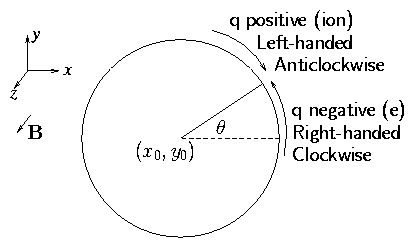 Conservation of magnetic moment is basically conservation of angular momentum about the guiding center. Consider angular momentum about G.C. Because θ is ignorable (locally) Canonical angular momentum is conserved. p = [ r ∧( m v+ q A) ]z conserved. So p = const ↔ μ = constant. Conservation of μ is basically conservation of angular momentum of particle about G.C. F|| may be enough to reflect particles back. But may not! 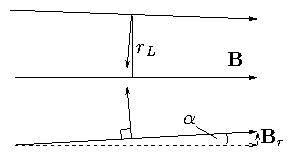 At reflection point v||r = 0. So, given a pitch angle θ0, reflection takes place where B0/Br = sin2θ0. If θ0 is too small no reflection can occur. 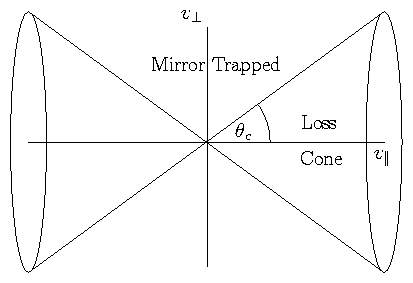 Loss Cone is all θ < θc. Importance of Mirror Ratio: Rm = B1 / B0. Flux enclosed by gyro orbit is constant. Note that if B changes `suddenly' μ might not be conserved. Slow variation of B (relative to rL). (dl and v⊥ q are in opposition directions). Notice that since Φ = [(2 πm)/(q2 )] μ, this is just another way of saying that the flux through the gyro orbit is conserved. Notice also energy increase. Method of `heating'. Adiabatic Compression. In the frame of the guiding centre which is accelerating, a force is felt. This is called the `polarization drift'. Figure 2.19: Suddenly turning on an electric field causes a shift of the gyrocenter in the direction of force. This is the polarization drift. Start-up effect: When we `switch on' an electric field the average position (gyro center) of an initially stationary particle shifts over by ∼ 1/2 the orbit size. The polarization drift is this polarization effect on the medium. add m i ω×(1) to q ×(2) to eliminate vD ∧B. Since −iω↔ [(∂)/(∂t)] this is the same formula as we had before: the sum of polarization and E∧B drifts except for the [1 − ω2/Ω2] term. This term comes from the change in vD with time (accel). Thus our earlier expression was only approximate. A good approx if ω << Ω. Seek the usual solution v = vD + vL. So we just need to find the average E field experienced. Expand E as a Taylor series about the G.C. ⎠ E+ cross terms + . (E.g. cross terms are x y [(∂2)/(∂x ∂y)]E). Average over a gyro orbit: r = rL (cosθ, sinθ,0). Average of cross terms = 0. There are additional approximately conserved quantities like μ in some geometries. Force is F = − μ∇B.